I love seeing jewelry this color – it can go with any clothes. It’s great to have a few pieces of jewelry, which you can just grab and not think if they go with your outfit – they always will. Since today I was on the search for great looking pieces of jewelry I encountered a lot of on line stores that provide unique pieces. I highly recommend http://amberbeata.com/ for their beautifully handcrafted collection of amber jewelry. Really its very pretty earrings.. I know about this type earrings first time from you so I am very thankful to you.. 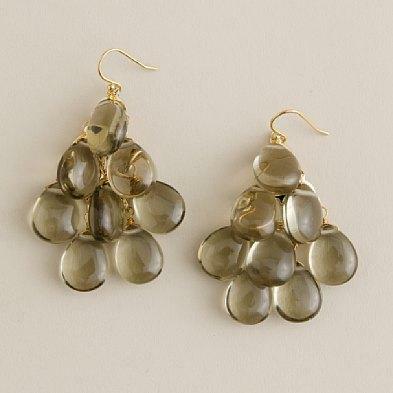 I get such nice information about this type earrings.. And I will like to wear it.. Thanks for sharing.. So fun for a party, and also great for day wear, Thats good idea! Love those earrings! They do look like grapes but also have a nice delicate touch to them! These are great! Perfect to go with some jeans like you say. A definbate shame about the Petrol thing!